Slowly but surely, the administration is tightening the screws on the much coveted H-1B visa for high-skilled immigrants. Donald Trump, the US president, has begun building a wall. Not the one with Mexico that he’s been threatening to build, but an invisible wall with India that threatens to shut Indian talent out of the US. A lion’s share of these visas, allotted via lottery each year, have gone to Indians. Data from the US Citizenship and Immigration Services (USCIS) shows that Indians received nearly 2.8 lakh H-1B visas in 2017, 75.6 per cent of the total number approved that year. Not surprisingly, California—home to Silicon Valley—received the largest share of H-1B visas. At face value, there’s nothing wrong in the stricter implementation of the law. However, Trump’s move needs to be seen in the larger context of an anti-immigrant government, run by a man who, ironically, boasts of having misused the H-1B scheme himself. Trump’s crackdown on H-1B visas has had an immediate effect, with a 42 per cent increase in the proportion of H-1B petitions denied for Indian-born professionals from the third to the fourth quarter of FY 2017, according to the National Foundation for American Policy, a non-partisan non-profit. “In the 4th quarter of FY 2017, 72 per cent of H-1B cases for Indians received a Request for Evidence, compared to 61 per cent for all other countries,” adds the report. While these measures may reduce the number of Indians entering the US, the administration’s plan to revoke work permits for H-1B spouses may drive existing visa-holders to leave the country. H-1B spouses are on an H-4 visa, or what The Economist calls the “involuntary housewife visa.” Until 2015, H-4 visa-holders weren’t allowed to work. The Obama administration changed the rules, allowing certain H-4 visa holders to apply for work permits. Of the 100,000 H-4 work permit issued so far, a vast number are to Indian women. 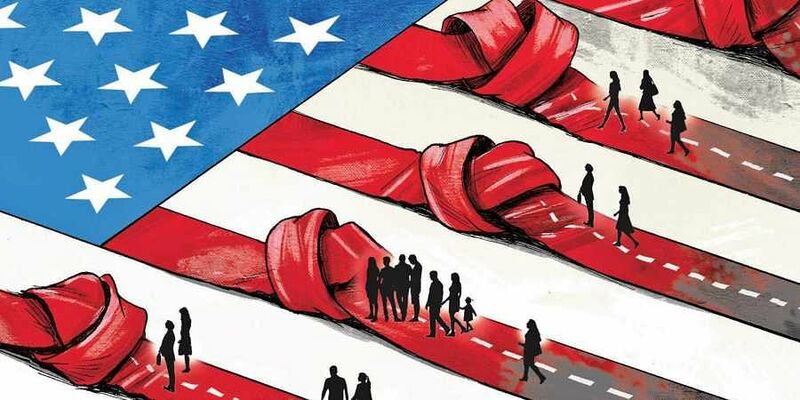 The US Department of Homeland Security (DHS) was supposed to submit a draft proposal on revoking H-4 work permits in February this year, but missed the deadline and announced in March that the proposal would be ready in June. A couple of weeks ago, the DHS said the proposal would be ready in three months. Once implemented, double-income families may suddenly have to rely on a single income, which will make it hard for couples to buy a home and plan their investments. “We’re living in limbo here….It’s a really, really bad and frustrating thing,” Priya Yadav, a 28-year-old employee at a tech company told The Mercury News. US senators Kamala Harris from California and Kirsten Gillibrand from New York wrote to DHS and USCIS asking them to rethink plans to revoke H-4 work permits. Their letter says, “Preventing women from engaging in employment can lead to isolation, depression, anxiety, feelings of guilt, and a loss of self-worth.” The letter talks of how increased isolation and financial dependence can make it hard to walk out of an abusive relationship. While H-1B visa-holders are backed by some of the world’s most powerful companies, they are up against America’s Right and Left. While the Right is against immigration, the Left is against employers replacing American labour with foreign workers at lower wages. Disney was widely criticised for firing 250 Americans in 2015 and replacing them with H-1B visa holders. While the H-1B visa is susceptible to misuse, as is the case with any policy, there are enough instances of employers hiring high-skilled foreign workers at high pay for talent that is not locally available. With the crackdown on H-1B visas, Silicon Valley fears a brain drain. For decades, brain drain was a term used in India largely in reference to IIT engineers heading for Silicon Valley. Trump’s crackdown on H-1B visa has resulted in talk of “brain gain”, with the hope these engineers will return to India. However, for many like Anu Mahendran, a Silicon Valley employee on an H-4 visa, India is a second option. The Mercury News writes of how she and her husband have filed for permanent residence in Canada, which has opened its arms to skilled immigrants. Much has been written about how Canada’s tech ecosystem is attracting top Silicon Valley firms like Amazon and Uber, while at the same time, Canada is receiving an increase in job applications from the US.Mumbai boy Vikram Rangnekar, a former LinkedIn employee in Silicon Valley who moved to Canada in 2016, is in the news for his hugely popular website MOVNorth.com, that helps tech talent move to Canada and guides tech employers on how to hire global talent. In a bid to restrict immigration and save American jobs, the country may end up cutting its nose to spite its face. Your land comments is perfect. I hope Indian IT sector grows from slave trade to product development in India by investing at least 50% of its profits. Considering low pays it may be 5X at comparable cost in US. Immigration Agent / CyberCoolie Business Model is now facing difficulties. Please try to create more good jobs in Mother India for skilled Indians.